Kirsten Murray is a principal and owner of Olson Kundig Architects where she has practiced since 1989. Her work spans a wide variety of project types including mixed-use, private residential, adaptive reuse, workplace and urban design, many of which have been recognized with awards including National AIA Honor and Housing Awards. Murray serves as co-director of [storefront] Olson Kundig Architects, the firm’s experimental installation space. She lectures widely on the subject of design and professional practice and regularly serves as a design juror, including participation as a juror for the 2011 National AIA Honor Awards. She recently authored a chapter, “Firm Growth and Development: How to Build a Creative Culture,” for the forthcoming Architect’s Handbook of Professional Practice. In addition to professional activities, Murray is active with community organizations, serving on the Board of Trustees for the University of Washington’s Henry Art Gallery and for ARCADE, a Seattle-based nonprofit that creates opportunities for sharing ideas about design, culture and the built environment. We are a multi-generational firm, and as such, we are like an academic environment. We have a strong sense of legacy and leadership provided by our senior partners, as well as a group of high level staff (much like professors) who are skilled generalist architects who understand our values and culture, and who can mentor younger talented staff as they bring their energy, enthusiasm and new perspectives to the practice. We maintain the practice of open studios, weekly critiques and pin ups, internal and external competitions, and regularly invite lecturers, artists and peers to enhance our program. My own architectural values are heavily rooted in Scandinavian modernism, and in other traditions that integrate landscape, history, and craft. These interests actually led me to this firm almost 25 years ago. Much of our firm’s work, whether a private home or public cultural project, deals with the integration of art and architecture. As such, we work closely with artists, curators, collectors, educators and community organizers. Their work and processes inspire us, as do the other design collaborators we work with, which includes our clients! The best clients become design partners; they bring great ideas to the table, push you to places you might not go yourself, but also trust your expertise. The idea of service is very important to me. I’m motivated by making my clients happy. I think our entire practice really emphasizes visual communication as a way to engage clients in the design exploration and decision making process. Drawings, models, and photographic imagery all feature heavily in our design process. There is the current topic that architecture graduates and young interns are not prepared when they enter the real world or the profession. What have been some key things about the real world and the design profession you've learned that you wished you learned early on? The transition from academia to practice has always been a difficult one in our profession. Fairly early in my working career, I became involved in creating our firm’s intern program, and it’s grown to be a real cornerstone of our practice. I personally think it’s okay for colleges to focus on an academic development, including liberal arts, etc., and that some aspects of the profession are just better taught in a practice environment. I think that’s the place where we as a profession can, and need to, do more by providing opportunities for entry level staff in our firms. Our program has rotating 6 month positions, a senior staff person or two assigned especially to mentor and manage the interns work flow, and we try to do as much as we can to expose them to all aspects of the practice. Each of them is expected to present their work to the entire office, and we offer portfolio and career guidance to them as well. I guess I’m old school in the sense that I see architecture as a form of fine art, and thus I really encourage students to keep their experiences broad, do as much travel, reading, experimentation as you can afford to do early in your practice. It all finds its way back into your work somehow. Organizations like Architecture for Humanity have brought forth the importance of architects and good design in humanitarian efforts. Also, the keynote speaker at this year's national convention is the founder and CEO of TOMS shoes Blake Mycoskie. Have you been involved in humanitarian projects? Service has always been a high priority in our practice. We have a deep legacy of involvement in our local arts and nonprofit community and integrate pro-bono practice in our work. Over the past 2 years we have been especially focused in creating an experimental public programming space in a storefront of our building. [storefront] Olson Kundig Architects is a work space for our community collaborations, pro-bono design work, philanthropic and volunteer work, and for design research and the development of design ideas. Installations have ranged from a record store (no records were actually for sale) with over 2,000 vinyl records available for listening to a mushroom farm where we cultivated oyster mushrooms grown on donated coffee grounds. Public events and regular open hours are a part of each installation. We also have participated with Habitat for Humanity, with Architects Without Borders and other construction-related organizations. In addition to the ethical value of these sorts of efforts, I think they have done much to provide an outlet for students and young practitioners during difficult economic times. It’s a great education for those who participate, and also a way to renew the sense that architects serve as stewards of the public realm (a historical role that architects have played and that has diminished somewhat in recent decades). Like Seattle, Portland, and San Francisco, I think a great city protects its history while allowing for change and reinvention. You can’t replace things like old neighborhoods, historic building stock, and the richness that comes from walkable communities. At the same time, it’s the layering of history and futurism that makes places vital, functional and real. Density is generally good for cities as well, even if the process of growing infrastructure and balancing economic challenges is messy. Architects are in a good position to wrap their arms around things that are big and complicated, and to bring a multi-disciplinary perspective to problem solving. I think there is a strong legacy of architects being leaders in social and environmental change, and I hope we never lose this impulse. I haven’t been to Nashville since I was in architecture school, but I remember having many aspects of my curiosity piqued there, the history, the culture. I remember you could hear Nashville before you could see it (via many fantastic small radio stations that you could pick up from miles away), so I hope to hear some music. I am a big music fan, old and new; folk, jazz, indie rock—all of it. 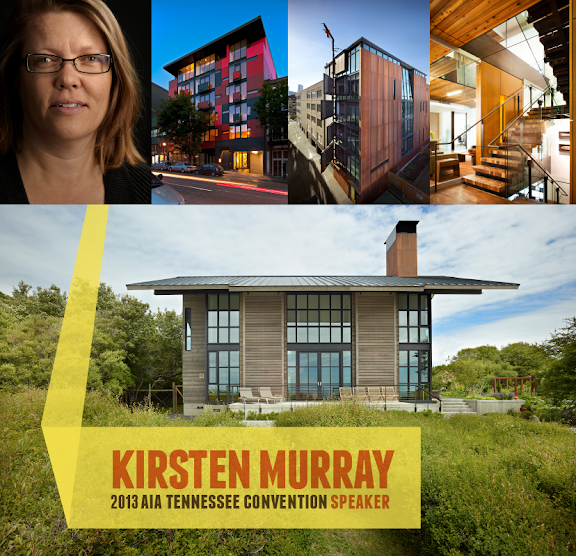 We look forward to Kirsten's presentation "Building A Firm's Creative Culture" at the AIA TN convention August 14. Read more about her through the links and resources below, and stay tuned for more speaker interviews. Go to the convention website for more details here. Photo of Kirsten by Kevin Scott. Graphic layout by Sophorn Kuoy.